Body— Two-seater, two-door sports car with roll-up windows. Rust proofed steel body. Laminated windshield with high impact inter-layer. Front hinged safety hood. Locking trunk with courtesy light. Full anti-burst door locks, one either-side-up key for door and ignition. Top— Zip-down rear window panel, soft top-vinyl inside and out, reflective safety striping around top. Soft top boot cover. Velcro strips on soft top and cant rails. Wraparound bumpers, front and rear. External, door mounted rearview mirror. Sealed beam headlights. Magnetic fuel tank cap with safety latch. Cockpit— Internal	dipping safety rearview mirror, seats with integral head restraints. Padded swiveling sun visors. Ambla upholstery, perforated on seat facings. Locking glove compartment with courtesy light. 5" 140 mph speedometer with resettable trip milometer. 5" tachometer. Ignition key audible warning device. Separate fuel, water temperature, oil pressure gauges, and ammeter. Variable intensity dash illumination, blue light. Combined ignition lock accessory control and starter control. Self-canceling turn signals. Vents for fresh air ventilation at face and foot level. Heating and demisting fresh air system. Padded 15" steering wheel rim and matching gearshift knob. Non-glare walnut finish dash. Four-way hazard flasher. Quick release seat belts with stowage holster on outside. Door operated courtesy light. And steering column lock. Ancillary Standard Equipment— Wheel changing equipment. Spare wheel and tire. Engine— In line, overhead valve. 6 cylinder, 152 cu. in. (2498 cc). Bore 2.94 in. (74.7 mm). Stroke 3.74 in. (95 mm). Compression ratio 8.5:1. Full-flow oil filter. windshield wipers. Electric windshield washers. Twin backup lights. Front and rear marker lights. Alternator. Drive Train— Four forward speed all synchromesh gearbox. Diaphragm type 8½" hydraulically operated clutch. Hypoid final drive beveled gears in cast iron case rubber mounted on chassis. Frame— Channel steel with cruciform bracing. Steel disc 15" x 5½" wheels. Radial ply red band tires Goodyearr 185 SR 15. Steering— Triumph rack and pinion. Energy-absorbing column 3¼ turns lock to lock. Suspension— Front:low periodicity independent system incorporating anti-roll bar. Coil springs and telescopic dampers. Rear: semi-trailing arm	independent	with coil springs and piston type dampers. All rubber mounted. Brakes— Vacuum power independent system. Front: 10 7/8" caliper opererated discs-front. Rear: 9" drums. Optional Equipment— Laycock de Normanville overdrive. Operated on 2nd, 3rd, and top gears. Reduces standard final drive ratio to 3.03 for smoother, quieter, more economical high-speed running. Wire wheels: 60 spoke, inter-locking hex nut type with 5½" rims. Vinyl tonneau coverer. Michelin X red band 185 SR 15 tires. AM/FM or AM push-button radios. Center console with or without clock. Luggage rack. Ski rack attachments. Front and rear bumper guards. Racing wheels: 4 spoke magnesium or aluminum. Cigarette lighter. Optional Racing Equipment— A complete line of Sports Car Club of America-approved	competition	equipment is available. For information write: Triumph Competitions Dept., Leyland Motor Sales Inc., 1957 West 144th Street, Gardena, California 90249. 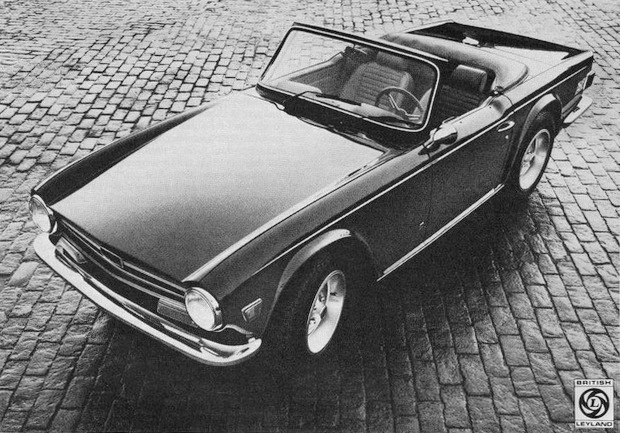 Comments on "TR6 Specification 1970"